New York, NY: Poor's Railroad Manual Co., 1871-72. Hardcover. Good. Complete but shows signs of wear. 9" x 6". Showing their Route and Mileage, Stocks, Bonds, Debts, Cost, Traffic, Earnings, Expenses, and Dividends, their Organizations, Directors, Officers, etc." 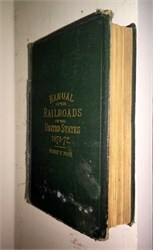 First published in 1868, Henry Poor's railroad manuals were an early form of business analysis that allowed investors to research the growth and financial health of companies. This 1871-72 edition includes 671 pages, including lots of old advertisement. Green cloth cover is separated at spine (outside), corners lightly worn and starting to fray a bit. Signs of wear and pages fully intact.